It had to happen one day. I feel slightly ashamed. But I assume that the Master of the Deuce-Four is pleased with the progress of the postulant. I went on to win the game. Everytime I get dealt the deuce-four I think of the Grump and his deuce-four words of wisdom and it tempts me to play it. Looks like he has you converted!!! Fitting that it happened against Lambsie. I'm sure he took it well. Went to PAO last night and every time I was dealt 2-4, I played it. Even that same 24c. Nothing. Nada. Zilch. Is there a mantra or something that has to be used when playing them? Honestly, I've learned my lesson with the 2-4, which is ~ 95% of the time ~ throw that sucker in the muck, with prejudice. The other 5%, in late position, raise it on up (especially if you're in a limit game OR playing against the Grump, or both). 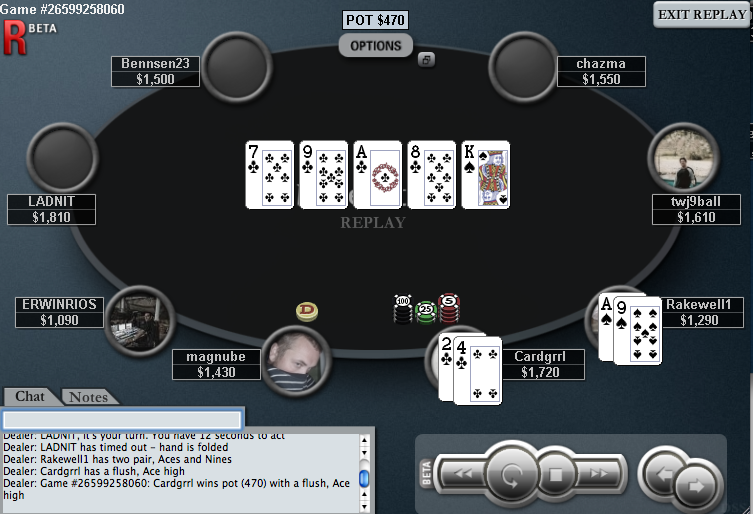 If you get everyone to fold, sweet! If you connect with the board, your hand is probably well-disguised. Post-flop play is your call: may the Deuce-Fource be with you! And . . . you had CRUBS! @BWoP: Omigosh, CK, you are absolutely right! Rakewell should have known that CRUBS ALWAYS GET THERE. I think we now know what happens when the irresistible force of the deuce-four meets the immovable object of crubs. We get the strongest poker hand ever created--the deuce-four of crubs!! 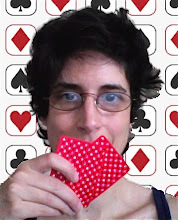 Cardgrrl: "Your deuce-four is in my crubs!" Poker Grump: "No, your crubs are all over my deuce-four!" Poker Grump: "Wait, I still lost!" Cardgrrl: "I'm sorry, did you say something? I was busy stacking all of your chips."